This is Lia, Tammy's daughter. I got to be a guest junior CT for Scraps N' Pieces on their new kit Pass, Set, Kill. 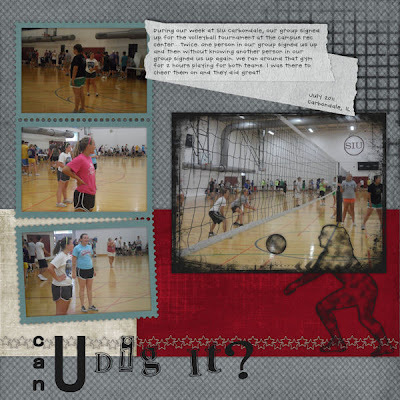 I created a layout of my friends playing volleyball during the Christ in Youth (CIY) conference at SIU last month. Here is a preview of the full kit. Kit and worn papers are bundled together at the My Memories store and their Scraps N Pieces store where it is on sale for $3.50 for the bundle for three days. If you would rather purchase the kit and worn papers separately, or just the kit alone, you can get them that way at Stuff to Scrap and if you check their forum in the What’s New in the Store section, you just might find a coupon for that. Image is linked to their Scraps N Pieces store, where you just might find a couple new designers this week. Worn paper pack is available bundled with the above kit at My Memories and Scraps N Pieces or separately at Stuff to Scrap.